Apple Coffee Cake Recipe with Streusel Topping - Let the Baking Begin! Apple Coffee Cake with Streusel Topping is a moist cake made with fresh apples and a delicious crumb topping. This Coffee Cake Recipe will become your favorite! The best Apple Coffee Cake Recipe! Two things make this Coffee Cake Recipe as delicious as it is – Apples and the Streusel Topping. Apples make any baked thing very moist, as they continue giving off the moisture into the cake long after they are baked. The Streusel Topping gives this Apple Coffee Cake a nice crunch and carameliness (new word that needs a place in the dictionary) that combine into a delicious combo. If you love Apple Desserts (click the link to see others) make sure to check out my other recipes! This Apple Coffee Cake is a recipe that’s simple and contains ingredients you most likely already have! So get your baking on and make this great Apple Coffee Cake! Thanks to BarbaraBakes for this wonderful recipe! 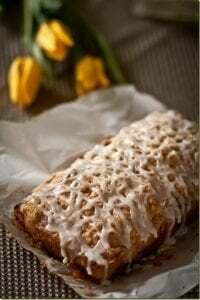 Can I substitute apples in this Coffee Cake Recipe? You can use any type of apple or berry! 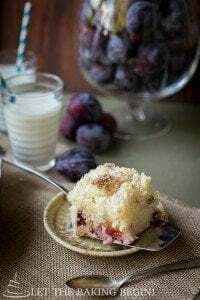 Fresh or frozen berries can also be used for this Coffee Cake Recipe! Just make sure not to thaw the fruits before adding into the batter. Now let’s get to it. Here’s how you make it. Make the streusel topping first and refrigerate – Combine melted butter, flour & sugar together, until crumbly mixture forms, then refrigerate. Butter the inside of a 9 in X 12 in baking dish. Add flour and shake the dish around covering the inside with flour, then shake out the excess. Set aside. Peel, core and dice apples into 1/2 inch cubes, then add 1/4 cup flour and quickly toss together. Combine the wet ingredients: Whisk 1/2 cup milk and 2 room temperature eggs together. Set aside. Combine the dry ingredients: Sift or whisk together 1/2 teaspoon salt, 1 1/2 teaspoon baking soda and 2 cups all-purpose flour. Whisk the butter and sugar together until smooth and fluffy, about 3 minutes. Without stopping the mixer add the wet ingredients in thirds, followed by the vanilla extract. Now fold or whisk in the dry ingredients until combined. Do not overmix or the cake will be tough. Transfer the apple cake batter into baking dish into an even layer. Top with the streusel topping by breaking it into smaller pieces with your hands. Bake at 350F for 30 minutes or until a toothpick inserted in the center comes out clean. Allow to cool before slicing and serving. There are many delicious ways to make Coffee Cake! What is one of your favorite Coffee Cake Recipes? 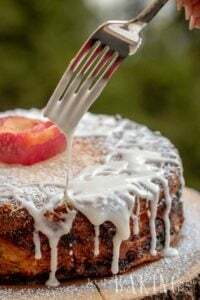 Quick Apple Cake – A simple and yummy apple cake! Apple Pie Bites – Mini pies with a warm cinnamon apple center. Apple Butter Cake with Cream Cheese Frosting – Light sponge cake with apple butter and a cream cheese frosting. Apple Coffee Cake w/ Streusel Topping is a moist cake with fresh apples and a delicious crumb topping. Make the streusel topping – Combine melted butter, flour & sugar together, until crumbly mixture forms. Put in the fridge until ready to use. Pour melted butter into the pyrex dish you’re going to bake the cake in. Brush the inside with the melted butter. Add flour and shake the dish around covering the inside with flour. Set aside. Turn oven to 350F. Put a baking rack in the middle. Peel, core and dice apples into 1/2 inch cubes, then add 1/4 cup flour and toss together. Whisk the butter and sugar together until smooth and fluffy, about 3 minutes. Alternate adding the dry and wet ingredients, by adding them in thirds. Do not overmix or the cake will be tough. Fold the apples into the batter. Transfer the apple cake batter into prepared baking dish into an even layer. Top with the streusel topping by breaking it into smaller pieces with your hands. * the milk can be replaced with buttermilk, sour cream or yogurt. Just use what you have on hand. Its apple/coffee cake but I don’t see coffee in ingredients? I made this and it is good. I thought just too many steps that were not necessary. Melted butter for pan needs only to be soft butter. Melted did not work for me. Also mine did not look at all like your pictures. The topping has to be reworked. We love us some streusel topping! These look delicious! A must make! Thanks for sharing! Thank you Trina and Tina! Enjoy! Thank you for this yummy recipe! Do you think this would work if baked in a 9×5 pan for 60mins? for more of a “bread/cake”? Thank you for this delicious recipe! I just made this coffee cake the second time. I’m having trouble with the streusel topping. 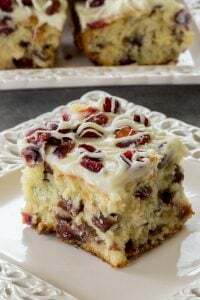 Instead of it staying crumby it melts to the top after baking. Can you please tell me what I’m doing wrong? 1 1/2 tsp baking powder or 1 tsp baking soda but in step 3 you have: Combine 1/2 teaspoon salt, 1 1/2 teaspoon baking soda and 2 cups all purpose flour together, then whisk together with fork or whisk. 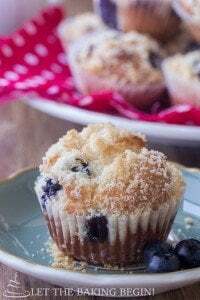 You had me at streusel topping 🙂 You have an adorable blog and I’m loving your foodie style! I love seeing step by step photos on your blog. They are really helpful. hey I wanted to know if you used baking soda or powder? the ingridients list shows powder but the picture shows soda? You can use either one. I corrected the recipe to let you know how much to use. One of my favorite cakes that I have made was an apple coffee cake with streusel topping. Yours looks fantastic! I love this cake- I love, love crumb cakes and apple does keep things moist! Hey girl, I just wanted to say I just absolutely love your cooking and baking!! !